Environmental watering provided drought refuges for fish, waterbugs, frogs and waterbirds in the Moorabool River during a dry 2015–16. Drought refuges (refuge pools) are sections of a river that hold water through long dries. 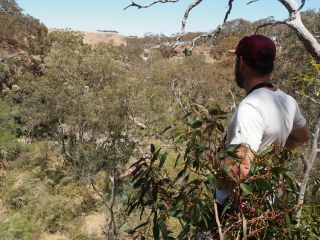 Drought conditions have continued to inflict high levels of stress on the Moorabool River, which needs catchment inflows and fresh water to support habitat for plants and animals. "Due to dry conditions, only a small amount of environmental water was available in 2015–16, so the aim of environmental watering was to maintain water quality and top-up habitat refuge pools that support life in the river," said Corangamite Catchment Management Authority's Saul Vermeeren. Ongoing drought and lack of river water created a dry riverbed in the lower reach of the river. 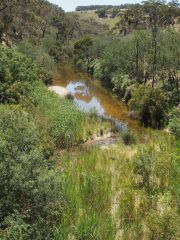 Environmental watering in 2015–16 was also able to fill the channel and reconnect the Moorabool with the Barwon River, providing a link for animals to move between habitats. Water quality monitoring at habitat refuge pools in some sections of the river indicated that environmental watering improved water quality conditions and supported fish, waterbugs and platypus. In wetter years, when more environmental water is available, the delivery of environmental water to Moorabool River provides social benefits (such as bushwalking, camping, recreational fishing and canoeing).